Business between Rwanda and India will become easier following an announcement that there will be direct flights from Kigali. President Paul Kagame has pledged that his country’s national carrier Rwandair will introduce direct flights from Kigali to Mumbai. The president currently on a 3-day state visit in India attended the 8th Vibrant Gujarat Global Summit 2017 alongside India’s Premier Narendra Modi and President Uhuru Kenyatta of Kenya. Bilateral Air Services Agreement provides for exemption of visa for diplomatic and official passport holders. The two countries also signed many other trade agreements that both countries have been discussing for a while. Kagame said that there is no time to waste and these deals should be signed right away. “We are ready to discuss business and investments right away. We have every reason to succeed in our efforts. 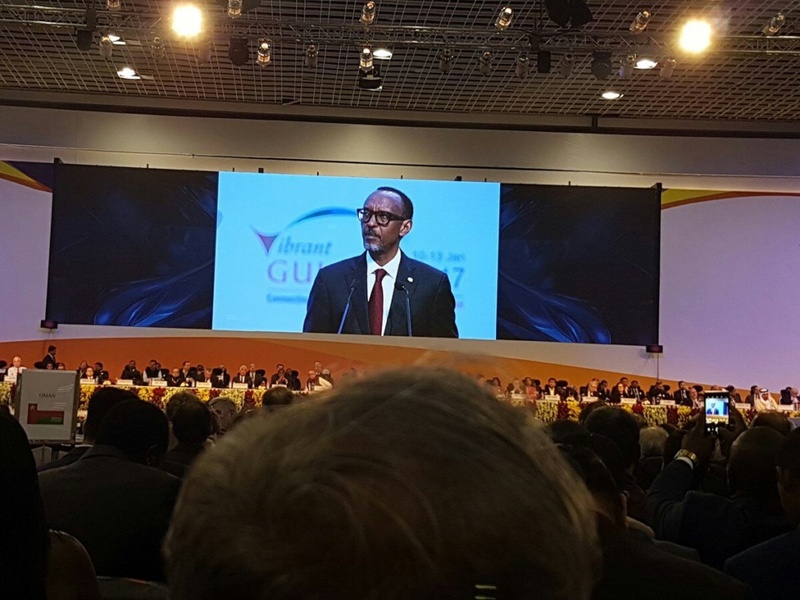 We are here to make it work,” Kagame said adding that the Rwandan team from the private sector was at the summit for that purpose. A flight from Kigali to Mumbai costs about $1500 and can take about 11 hours and one has to make stopovers in Africa especially in Entebbe in Uganda, Nairobi Kenya and Addis Ababa in Ethiopia, before connecting to the Asian continent. A direct flight to India is now feasible. Rwanda has prepared itself for such a mega deal which will change business communities between Rwanda and India according to the president. So far Rwanda has signed a mega aviation deal that will see construction of Bugesera International Airport (BIA) to be in position to handle increasing air traffic and to reduce congestion at Kigali International Airport. The government entered a joint venture with Mota-Engil, Engenharia e Construção África, S.A. – a Portuguese company to construct the airport located 12 km from Kigali International Airport at a tune of $818 Million. The first phase due for 2018 will cost $ 418 Million with a capacity to receive 1.7 million passengers annually, then 4.5 million passengers after extension. In terms of capacity, the National carrier, RwandAir has bought more aircrafts expanding its fleet to 11.- with Two Airbus; A330-200 “Ubumwe” and A330-300 “Umurage” with 244 and 274 seats respectively were acquired this year. 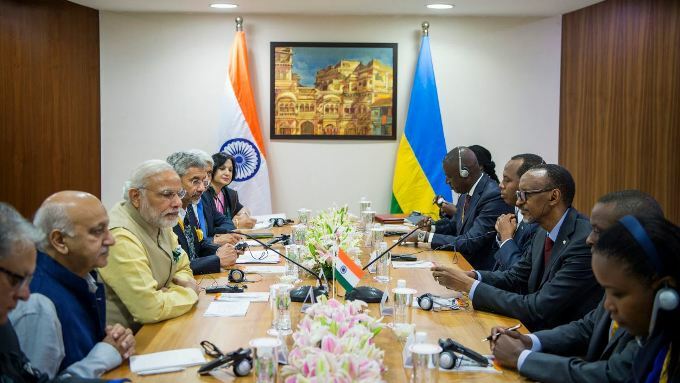 Kagame said that trade between India and Rwanda is growing but added that there is much more potential for investment and joint ventures between the two communities, which have a long standing trade relationship for the last years. 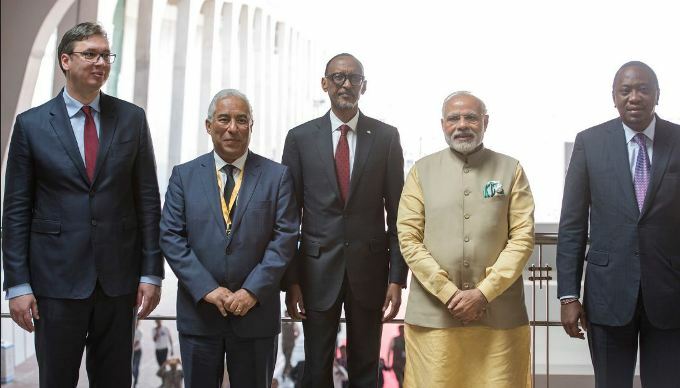 “India’s long tradition of successful businesses is a good match for the ambitions and opportunities available in our countries,” Kagame said. President Kagame is in Gandhinagar city in Western India as part of a 3-day visit during which he also spoke at organized business events. 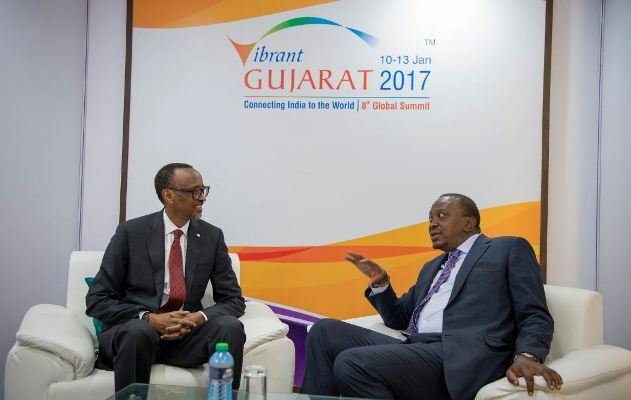 Kagame and his Kenyan counterpart Uhuru Kenyatta held talks on the sidelines of the summit and both expressed high expectations from the deals that both countries will be picking up. “This will be beneficial to the private sector of both countries. This forum avails a unique opportunity for Kenya and Rwanda to further the cause of development and promote cooperation,” Kenyatta said. Kenyatta also called for use of the good business environment and robust growth for a win-win situation in areas like food production agriculture mining and among other emerging sectors. Both countries are expected to discuss further how to improve collaboration in trade, healthcare, manufacturing, defense, and ICT.